Khushi Feet’s first fundraising concert in the USA will be taking place in New Jersey! 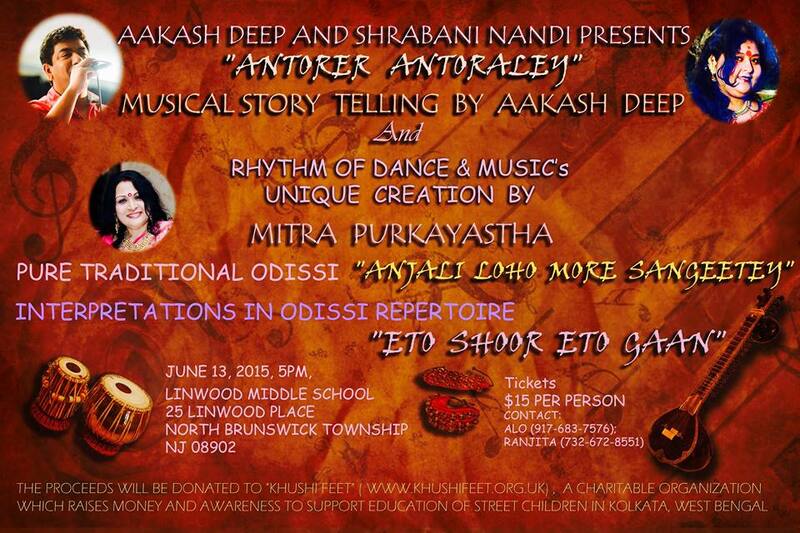 Aakash Deep (New York based Indian musician/singer) and Shrabani Nandi will present ‘ANTORER ANTORALEY’ (অন্তরের অন্তরালে) a “uniquely designed music and dance concert to raise funds to support the education of orphan children in India”. The event will take place on Saturday 13th June 2015 at 5pm, at Linwood Middle School, 25 Linwood Place, North Brunswick Township, NJ 08902. Tickets cost $15, please contact Aloo (917-683-7576) or Ranjita (732-672-8661). Aakash Deep blends melodious Bengali style singing with old movie songs, new age bands and Hindi urban styles. His voice has a unique and non-conventional tonal quality, range and depth. He gave his debut public music performance at the age of 9 and started performing all over Kolkata by the end of high school. He received his early age training from the laate Sri Binoy Bhattacharya and later from Sri Kumar Ray for vocal rendition in Hindustani Classical. Aakash Deep founded an Indian mellow rock band in Bangalore, India during 2001 and was one of the lead singer and composer for this band from 2001 to 2005. In 2004, he was signed by Times Music as an ‘Exclusive Artiste’ and released his debut Hindi album ‘Nadiyaan” along with two music videos directed by acclaimed video directors. The video topped the charts of leading music channels of India and received critical acclaim. In 2009, Aakash Deep released his debut Bengali music album “Chhoto Chhelebela”. Aakash dedicated this album to all the homeless and orphan children across globe and commits the royalty of the album to child welfare. Aakash Deep currently lives in New York, USA promoting Bengali and Indian music in the North America region. Emily, our Founder and Chair, met up with Aakash in New York to talk about Khushi Feet and the upcoming concert Antorer Antoraley.